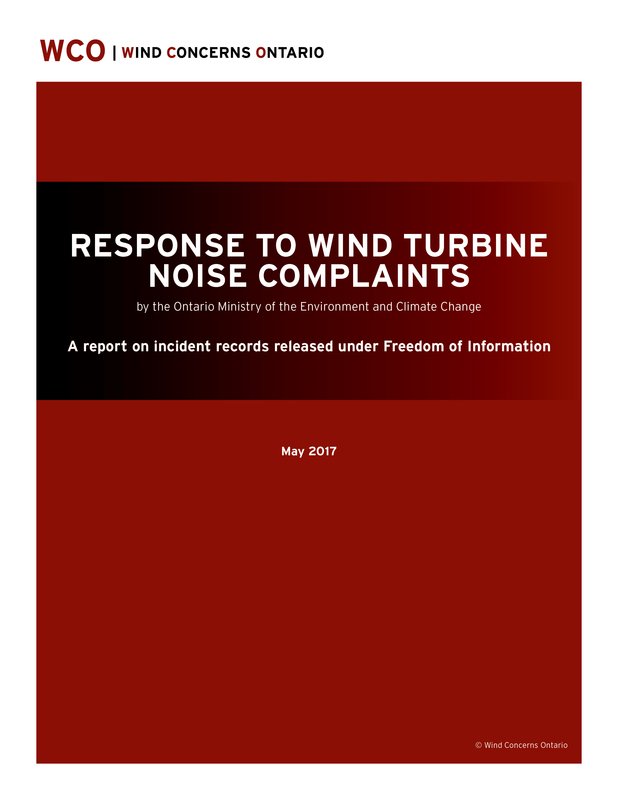 Documents recently released by the Ontario Ministry of the Environment and Climate Change (MOECC) under Freedom of Information show a deeply flawed process for responding to complaints of excessive noise levels from industrial-scale wind turbines, Wind Concerns Ontario says. Documents released to Wind Concerns Ontario, a coalition of community groups and citizens, show that almost 3,200 reports of noise complaints were made in 2006-2014. In more than half, the government took no action. “When Premier Dalton McGuinty brought in the Green Energy Act in 2009, he promised the people of rural Ontario to address concerns about health and safety from the turbines,” Wind Concerns Ontario president Jane Wilson said. “But they already had multiple complaints about wind turbine noise from 2006 onward, and they were unable and even unwilling to deal with them. This is failure of a government to protect people. 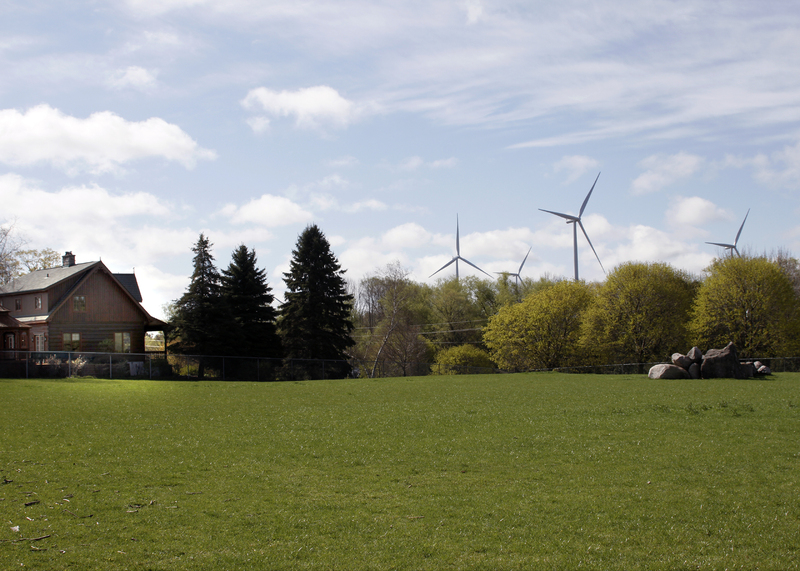 Ontario families called the MOECC hotline to report sleep disturbance, headaches, and dizziness from the wind turbine noise emissions. Some were desperate and reported not having slept for days, even weeks at a time. The reports show, however, that ministry staff had no protocols or guidelines to deal with noise complaints and that high-level directives blocked staff from responding. Staff were told to rely on computer noise models provided by power developers instead of actual noise measurement. Many reports referred to vibration or “pulsing” sensations from the huge turbines, but the MOECC restricted responses to audible noise alone. A revised Compliance Protocol was released by the government on April 21, but contains no substantive change to the complaint process. Wind Concerns Ontario recommends that no more approvals or Notices To Proceed be granted for wind power projects, and that the government develop and enforce new, tougher noise standards. Wind Concerns Ontario is a coalition of community groups, families and individuals concerned about the effects of industrial-scale wind turbines on the environment, the economy, and human health. Excerpts from MOECC Pollution Report documents, provided to Wind Concerns Ontario. Do you suppose our Mz Wynne could be talked into installing those windmill towers across Toronto and using her math push payment of for 30 or 40 years, she could then install highways on them and solve Torontos traffic problems while leaving those in the path of windmills alone. It takes extreme tenacity to endure the harm from turbines and persist with the absolutely frustrating experience of reporting to the SPILL HOTLINE and dealing with the bungling of the MOECC. People who work away from their homes cannot take the time to do what it takes to seek protection. For some people, the frustration and distress is heightened by the complaint process. I strongly suspect that the people who gave up complaining, decided to leave their homes or are now ‘suffering in silence’ and using ‘flight’ as a coping strategy, especially during the day. Watching the response that Minister Murray gave to the Global News reporter was upsetting. He singled out the K2 Project as the only one that is problematic, because the tenacity of the residents has finally caused him to realize that there is serious resistance to this abuse and neglect. The reports residents sent were sent to a long list of recipients, all collectively responsible for the harm. Surely these people should have pressured the MOECC on behalf of the people being harmed and yet after two full years the turbines are still running. This has been a failure on the part of government agents at all levels. Since then there have been numerous delays. Finally, on May 12, 2017, Huron Health Board sent a letter saying that they lack the authority to turn the turbines off. Does anyone know the length of time to act and the legal ramifications for inaction for a Health Unit and a Health Board, when a declaration has been made public that the ‘criteria for assessment’ has been met and the need for an ‘investigation’ is announced to the community? If this was any other health concern, that was brought to the attention of the Health Unit and the Health Board, would these delays be happening? And keep in mind that ONE complaint is often about a whole family suffering! Why are turbines being installed on Amherst Island when less than 5 Kim’s away are the two gas plants at Bath only operate part time ( one of them is a new plant that was moved from Oakville or Mississauga)? Secretariat of the Convention on the Conservation of Migrating Species of Wild Animals (UNEP/CMS). There is also more information on the UNEP/CMS available online. Or search under the Bonn Convention. Birds list: Click on the Aves box. Insects list: Click on the Insecta box which lists the Monarch Butterfly. There is also a species proposed list. I tried to do one for Health Canada one time. It came back with no information for complaints. So I think Health Canada just throws the complaints in garbage. The residents who persisted sent emails and sent them directly to a growing list of recipients. Eventually, the list included over 50 people, including local municipal leaders as well as various levels within both the provincial and federal government. One would think that receiving so many complaints would cause these individuals to apply pressure of some sort on Minister Glen Murray to take expedient action to protect these residents from noise. These residents also met with the MP to get help with having the Minister of Health enforce the radiation emitting devices act because people were experiencing well known symptoms of infrasound radiation and low frequency noise modulation…to no avail. Many times all recipients were asked to answer questions within 10 business days. With rare exception some responses were received, but for the most part the recipients didn’t respond at all. The Premier’s office sent out the same canned/ robotic response within minutes of receiving those emails, saying how much Premier Wynne valued receiving the messages and then nothing more. Prime Minister Trudeau’s office did the same thing. These emails will be used as evidence. The federal government encourages investment in renewable energy and provides tax benefits to renewable energy developers. At almost 2 km distance, my complaint could not attract MOE response. MOE’s view: my residence was too far away to hear the audibles, which is all they were interested in. Result: I have commuted 20 miles each night for sleep. For five years. Why report to the spills action center? After a million calls over the years, nothing has been done. I guess I’ll continue to bang my head against the wall…until I’m dead. Tracy, this is how many residents feel. The person answering the SPILL HOTLINE supposedly conveyed messages. but the follow up was ineffective in protecting people being harmed. Some residents diligently persisted despite the fact that they felt it was a useless effort. It will take real action on the part of the MOECC now to renew peoples’ faith in the MOECC as a protector. IMO, this is deliberate and not bungling. Now if you found a rare toad or owl in the area they may have not put the turbines up at all. But you are just people. Yes, this is the cruel irony. Rural residents who have been/are being harmed have been treated with such disrespect…such callous disregard. Their disillusionment with this government is severe. Wow…. my bloods boiling after watching that sh@tshow!!!! Nothing like being talked down to again and again..!!!!! Some of the MOE …. MOECC…. Premier Wynds… comments towards rural folks concerns were disgraceful ….. disrespectful… and again shows why rural citizens are quickly becoming enemies of the state!!!! Thanks for sharing the link so that people can make this go viral as quickly as possible. Now everyone can see what rural residents who are being harmed to this day have been up against…the violation from noise, low frequency noise modulations and infrasound radiation in their own homes and the added abuse by this government’s refusal to acknowledge the frightening situation they face and protect them immediately, is real. Watching the tactics being used, in response to the excellent questions being raised, was sickening. I feel sorry for the Pages who witnessed that scene. The grave looks on their faces, as they watched adults who are supposed to be working together to protect the citizens of this province, left a deep impression. These young people are chosen because of their brilliance. They surely could see through the deflections and refusal to answer the questions being asked. It’s a shame that this issue has to be sorted out in the pathetic, partisan, political arena we have in this province. About 8 minutes into this one….. how frustrated are we in DD???? REAL FRUSTRATED!!!! The root problem are the corrupt government officials in the MOECC working FOR the wind industry. Who agreed to the “terms and conditions” of the failed compliance protocol and the GEA? This protocol makes it Impossible for the MOECC or independent acoustical experts to determine noncompliance. The MOECC can say all day long that they “appear” non-compliant but, the only one who can DETERMINE noncompliance (which can then lead to action) is the wind company itself. This MUST be addressed! Can the people within the wind companies be trusted to tell the truth and protect the nearby residents? “Question Period” for a reason…. I felt so insulted after watching that session ….. they are not going to stop this madness for anyone.. not existing projects or future projects…. Remember folks… suspension of procurement isn’t cancellation of procurement… if the lieberals win next election they will bury the rural people with IWTS…. it will take more than an election to stop these projects…. This is no time to be pessimistic. It has taken a great deal of effort on the part of residents who have been extremely persistent, while so many others have given up in despair. These residents in Huron County are refusing to do that. People need to support them by reporting to the MOECC through the MOECC SPILL HOTLINE. Put Minister Glen Murray’s words to the test as quickly as possible. Report every time the noise, the low frequency noise modulations and infrasound radiation are reeking havoc on your mental and physical well being. If no positive results come from this renewed effort, then make sure the media finds out about it. Premier Wynne wants everyone in the province to think she truly cares about their well being. While this has certainly not been the case so far, let’s see if she actually does care now that she has been so powerfully shamed for neglect of duty to protect. It’s pay-up time for those who voted in the present government. Cost of food is rising again to cover the carbon tax imposed on Ontarians. For example, look at the price of meat. Farmers can’t afford the production costs of food and make a profit. And with the low value of the Canadian dollar, many people can’t afford to buy imported food from the U.S. The timing of the release of this document is interesting..are the idiots on summer break? We will not settle down over the months. I will be even more livid as time passes. I DEMAND THE EXISTING TTURHINES BE TURNED OFF DUE TO THE ILL HEALTH EFFECTS EXPERIENCED BY THOSE LIVING CLOSE TO IWTS. The government is being negligent, deliberate negligence. Irrepairable/irreversible harm is brought to those who suffer health issues. I recently asked Mike Crawley turbine developer, to purchase my home in Clear Creek for a reasonable amount of money. He passed the buck and referred me to GDF Suez although Crawley was the initial developer. This has been going on – I’ve be bitching for TEN YEARS. There is no fair compensation for my losses. As a start, I would expect to receive every penny made by every turbine in the surrounding development TIMES 2 at the very least plus more. Yes that’s a lot of dough, but is nothing compared to multi billion dollar income these thieves too from the taxpayers of Ontario. Please excuse the typos. My vision is completely screwed as well. At times I have double vision. When this same government was told by the Society of Engineers that up to 30% of the proposed smart meters could never work for various common reasons and perhaps as high as 50% would still need to be monitored manually but they went ahead anyway. A billion dollars taken from ratepayets for smart meters to correct a problem that was only in their minds. The McGinty/Wynne government has been the most patronizing and corrupt bunch of backstabbing liars that I have yet to witness. Now it is the norm to pay for access to your MPP and the back room deals are expected. Greed is a disease and the Ontario Liberals have got it!